After all the ranker about local development projects during the election, I asked John and Tim of The Maryland Crabs Podcast if they’d be interested in having me on to talk about development. Much of the discussion focuses on who can say NO the loudest. Ultimately it’s disingenuous to just talk about yes or no on more development or just about the traffic issues. We need to question the underlying assumptions that go along with local development such as the implications of various styles of development on mobility. I lso really wanted to discuss local development in a Strong Towns frame of reference by bringing in the idea of productivity of development styles. It was a lot of fun and I hope I was able to bring a different view to the development discussion. I definitely can’t wait to be back to be back on the show, especially given that we all like to have “beer drinking episodes”. I also got a nice look around The Commons, a local shared work space on West Street where they do many of the podcasts now. This entry was posted in Annapolis , Urbanism and tagged Strong Towns on December 29, 2017 by Alex Pline. 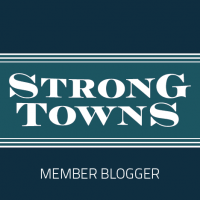 Proud Supporter of Strong Towns!